This spacious 2 bedroom apartment is situated above Peyia village, a few minutes from the centre of Peyia village, which has a good selection of shops, tavernas and other amenities. Coral Bay with it’s golden sandy beach is only a 5 minute drive away. The apartment comprises a large well equipped kitchen nicely separated from the spacious lounge and dining area by attractive archways. From the lounge, sliding patio doors open on to a balcony with stunning sea views. Off the living room a hallway leads to a guest toilet and two double size bedrooms, both with fitted wardrobes and en-suite facilities. The master bedroom, also with direct access to the balcony, enjoys the same fabulous views and amazing sunsets. There is a quiet courtyard garden at the front entrance of the property, providing a second outdoor leisure space for dining and relaxing. The complex and swimming pool area is very well maintained and includes a BBQ area with pergola. There is a lift up to the apartment from the allocated parking space. 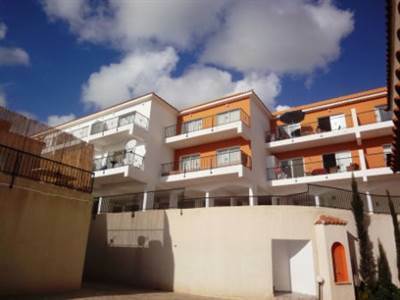 The property is ideal as a holiday home/rental investment or permanent residence. It comes fully furnished with title deeds.